Dr. Tri T. Nguyen, M.D. hails from the Gulf Coast city of Lake Jackson, TX. He received his medical training at the University of Texas Southwestern in Dallas, and he completed his residency at the University of Texas Health Science Center in Houston. 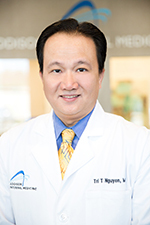 In 2004, Dr. Nguyen began working with Dallas Medical Specialists, and today he provides outstanding internal medicine services in Addison and Carrollton for a variety of diverse medical conditions. In his free time, Dr. Nguyen enjoys giving back to his community through a charity that he founded to assist orphaned children in Vietnam.